This year the International Women’s day was a different experience for me, no panels stating gender diversity facts most people are painfully aware of. Instead I had the proud privilege of being invited to do a fireside chat and explore new dimensions of diversity and its impact on innovation and business growth. We are familiar with dimensions of diversity we are born with — gender, age, race etc. but less familiar with the dimensions we acquire in our lifetime — culture, life experiences, domains worked in, education background etc. These interesting dimensions set your thinking patterns, beliefs and problem-solving approaches. Diversity is an intellect multiplier but, only when diverse groups can collaborate. We need a common language that helps diverse groups come together and collaborate. We need an inclusive environment that fosters diverse perspectives without judgment… here’s where design thinking comes in! Design thinking in its application celebrates diversity, when done well allows you to go broad try many, diverse approaches before narrowing down to one solution. It can also change how people work together for the better, introducing a deeper level of collaboration, appreciation of diversity and creativity. 1. Don’t brainstorm; think Independently, together While we are not against brainstorming, we believe brainstorming can lead to HiPPO decisions (Highest Paid Person’s Opinion) and can exclude out-of-the-box thinking because the facilitator or the group naturally judges all ideas being generated. Instead have everyone think independently and write down their ideas individually and review every single idea. Similar ideas get grouped together, no idea gets left behind or judged right away. Instead we build on existing ideas to make them more diverse and disruptive. It is a powerful process that celebrates diversity and creates an inclusive environment for disruptive ideas to form and persist. 2. Narrow ideas using clear criteria – The 2×2 tool is a narrowing tool, allows you to choose ideas that the team will filter down to. The team identifies 2 key criteria to narrow ideas (ideally, customer benefits) that would make massive impact on the business. Ideas are then plotted against those dimensions relative to the benefits it brings to the organization versus making Caesar-like decisions. Again allowing diverse teams and ideas to collaborate well hence leading to innovation and business growth. 3. Facilitating large group dialogues – The World Café is a structured tool intended to facilitate collaboration, initially in small groups and then linking ideas within a larger group to access the collaborative and collective wisdom in the group. Each person interprets the world differently, based on his/her perception. Sharing the viewpoints of others is essential for understanding alternatives and adapting strategies to deal with environments. Environments that recognize the contribution of all will foster a strong commitment to achieve common goals. Diversity offers different experiences and novel perspectives, leading to better decision making and problem solving. It opens up new conversations pushing the boundaries on unrestrained thinking which enables breakthrough innovations. At Pensaar, one of the things we celebrate is the differences we all bring to the table. Each of us comes with unique experiences having worked in varied industries and lived very different lives. It allows us to recognize each other’s strengths and learn from each other while also being sympathetic to each other’s weaknesses. Our different experiences and perspectives help us foster innovation to beat and not just meet the needs of our increasingly diverse customer base. In a highly competitive marketplace we all depend on nimble creative thinking to solve problems. 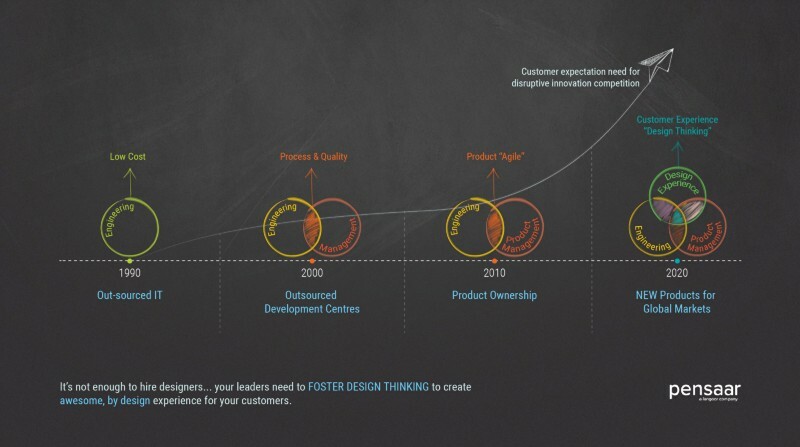 The center of design thinking is the end user experience – which in turn reflects the brand philosophy and ideology. The process starts with the people that we are designing for and ends with creating products, services and experiences that add value to the lives of people. Design plays a critical role in the image of your product and your business. For instance, when you browse a website, it takes nothing more than a few seconds to make a judgement on whether you like ‘how it looks’. In a few more seconds, you have created a perception about the brand, deciding if you will trust the brand and if you would like to buy the brands product. Design plays an important role here, it talks to consumers like you and me; it helps create and image, change perceptions if need be, and creates the unstated experience for consumers.The ‘Design Thinking‘ session will focus on the power of design to solve problems with creativity and an interest for the customer, while building a brand. The session will cover all aspects of design – from brand design, to experience design, to marketing design but will largely focus in-depth on user experience design. There will be many examples from the Urban Ladder context across our journey, and a sneak peek into our next evolution. The session will also leave you with specific metrics to measure the impact of design thinking and develop appropriate implementation plans for new solutions. This Playbook Roundtable is scheduled for 19th November(Saturday) in Bangalore and will be led by Rajiv Srivatsa, Founder & COO at UrbanLadder & Prateek Dixit, UX designer, UrbanLadder. This Design Thinking Playbook is open to innovative start−ups and passionate entrepreneurs who are ready to accept one of the first challenges in Design Thinking: Your user knows best! When it comes to building a product, I had absolutely no experience before Pricebaba. While building Pricebaba.com I did learn many nuances and tricks for growth. I am grateful to the friends and mentors who have always helped us understand users better and how to build a great product. It was a pleasant coincidence last week when I got two opportunities to understand design better — first, I attended the Design Quicky Mumbai event hosted by 500 Startups and later in the week, iSpirt organised a roundtable session on Design Thinking. Deepa Bachu who is currently running a design consultancy firm Pensaar shared her 15+ years of experience working in the industry with brands like Intuit. Here are some key takeaways from that session. According to Deepa, the key metric to chase / track is customer benefit metric (CBM). It’s simply how do you make your customer’s life easy. For Google, customer benefit metric would how be quickly it’s able serve the result and how relevant they are with user’s search query. This makes so much sense. If you look closely, all the updates Google has made are around that — be it with the Panda or Penguin update, to give the best result in minimal time. Once you start thinking of serving your current users better, if they are truly benefitted with your product, they are going to use your product again. This leads to increase in MAU, decrease in bounce rate. All of your other metrics will fall in place automatically. Take marketplaces for example, they are serving two kind of customers — Merchants and Shoppers. Their key to success would be to make sure Merchants sell goods regularly and efficiently. They can enable this by reducing returns, empowering logistics and customer support. Whereas on the other hand making sure users get what they want at the right price and their journey to checkout is as smooth as it can be. For us, at Pricebaba it’s quite similar to marketplaces. Our customer benefit metric would be to make sure the returns on the partner’s platform are under control (thereby making sure conversions are higher). On other hand for users it would be how effectively we help them choose the best product for their needs. On Pricebaba a user can be overwhelmed by 175 products from the same manufacturer (eg: see Samsung Phones), our advanced filters is a way to help our users narrow their purchase decision faster. However for us bigger boost comes from helping the user get the top 4 or 8 products accurately in the first fold. Deepa started her talk with how India is still not there when it comes to design thinking or product innovation. We do not think Design while building our Products, she suggested. On that remark, I jumped off my seat and said “this is not true”. People are talking about design. I sincerely believed this is now a key role in the product making, which was not the case 4 years ago. But, by the end of the session I realised she was right. Amongst many missing ingredients in our startup ecosystem, “design thinking” is one of them. We admire good looking design. We love clean, plain and simple. We look at design only by its visual perspective (is it appealing to the eye?). But, we forget to see the functionality or usability. That is arguably more important aspect of design. Throughout the session we had one white board on which we wrote what design means to us. We wrote apps we love and products which we consider as good examples and inspiration of good design. The participants initially thought design had a lot to do with ‘Art’, ‘Painting’ or ‘Creativity’. As we went further, our understanding evolved and ‘Emotion’, ‘Customer Journey’, ‘Elegance’ were the new keywords on the whiteboard. Going further it was ‘Customer understanding’, ‘Outcome’ and ‘Need’. Eventually, it all boiled down to one thing — ‘Metric’. If your numbers (in our case, Consumer Benefit Metric) are not increasing, all your Dev, BD or Marketing efforts don’t matter. Benefit I care about: What is your service about? What is that one benefit you are serving your users with. The value proposition of your product. Nail that first. Achieve excellence. For my product Pricebaba, it is how a user get the best deal of a gadget suitable to their needs. Ease: How easily your users are able to get the benefit we talked about. How are you making things simpler for them. UX has a major part to play in phase. For us, it would be how easy are the choices we offer our users to narrow down on the right gadget. Positive Emotion: This is the part where actual UI comes into play. Users Delight will be the positive outcome of great UX and UI. To sum it up, focus on what your business has to offer. What is that one benefit you are giving your users for which they will keep coming back to you. Create a good UX to make their journey to avail that benefit easier with great UI. There, you’ve got your “Ahaa!” moment from your users. While building a product we often tend to build it the way we perceive things. We build a feature / flow in a certain way we think is the best. So many times we assume we know what users want. Taking some decisions from the gut is good. But building an entire product without interacting with actual users is not. You need to validate that gut-feel by talking to users. Observe them as use your product. We did a exercise where entire company went out on streets and interacted with users. We called it ‘Project Dragon Scroll’. We gave our potential users a simple task to search best price of a mobile phone. We were surprised to see so many of our myths and biases were getting resolved. Deepa shared tons of examples with us, making us realise that it is too difficult for a product to evolve if you don’t include your users in the process. For that you need to go and talk to them. Even understand what they are not saying. Ask questions. There are tons of tools for that. Just asking them question via surveys, making sure your Net Promoter Score is high might not help. Those online activities are needed, along with offline activities too. Also, you need to see the data on interaction, deep dive into metrics, logs, analytics to get a 360 degree view of things. Taking decisions based on only one of the above factors mentioned won’t help. You need to get out there on the streets, deep dive into analytics (GA, Clevertap, Mixpanel) and use online tools to see how users interact (A/B testing, Heatmaps and Surveys). Tirthesh is co-founder of Pricebaba, one of the biggest product research and price comparison platform in India. A developer at heart, Tirthesh had the pleasure of being part of a journey since 2011, where a two-person team grew into a strong workforce in a matter of three years. The Design RoundTable last week lead by Deepa Bachu and Rajan, was not what I expected. By and large, design to me was either a part of an application (UI / UX) or a concept which i did’nt know much about. But, when we went in depth with Deepa, I realized that design is an integral part of who we are and what we see around us. Through detailed discussions, we were made to think about what design is and what design meant to individuals, communities, startups as well as our customers. The first task started with a a simple question, what is design? One can come up with several ways to describe it and the audience described it as – Design is something that solves a need, brings convenience, humanizes products (i.e. bringing human touch to products), explores empathy, understands customers and is about continuous learning. What stood out for me was that design is all about Love and passion in order to bring out the best products/services to address a customer need, in a manner that creates value with ease and convenience. This would enable the users to be at ease and fall in love with what it represents. If a design is thought through with love, compassion and empathy, the user’s journey and experience improves. The first task in the workshop was to work in a group and explore design features (good vs. bad designs) both within and outside a room. This enabled us to look at things from a design lens. The group came up with very interesting insights of how people dry their clothes in modern buildings differently from those who dry clothes on their balconies or how badly the electric poles in India are designed or how cobbled streets are an interesting design element than traditional tar roads. This experience made us understand and be aware of the small and subtle difference between good and bad design. I was able to realize and conclude how crucial it is to be empathetic to customer needs and when, where and how they experience a product / service. Hence, it is essential to understand things from the customer’s perspective which eventually helps us improve the utility of the product and services that one offers. This applies to all our products and services. We are all trying to build a product around enhancing the customer experience and thinking through each aspect from the users point of view is crucial. How does a user discover your product or hears about you? How do you ease the process of sign ups? How important is the design of your website or application? What does the product do for the customers and what are the benefits of it? These are just few examples of how we can think from the customer’s point of view. By allowing ourselves to think from the customer’s perspective, we are enabling us to re-imagine the product and user’s journey through various channels to engage and enrich with the user. Another interesting insight was around humanizing products as consumers are humans. Adding a human touch to design can make an experience great. For example, addressing consumers in emails by their names or to have a real person to sign off at the end of an email. There were many other aspects we covered in our conversations. We discussed the importance of elegance in design and a belief that “UI without UX is Superficial”. We also discussed the importance of creating that WOW factor or customer delight in making customers your brand ambassadors. For creating customer delight, one has to first answer what benefits a customer will get and how one can create customer experience through positive emotion. The combination of these simple three stage processes will help us to think through the various customer delight experiences that we can design. Another tool that Deepa spoke about and is quite helpful is an Empathy Map. It is a 2×2 matrix to understand the journey of a customer. Four questions need to be asked. 4) How do they feel over all. This is an experiment which should be done periodically with various sets of customers which can make each member of the team sensitive to the customer journey. An interesting point learnt is that every time we have an insight on one of the four touch points — Say, do, think and feel , we could use this as a starting point. For example, while booking a flight online, how is the customer journey when they first login, are they looking for the cheapest price if so what do they say about that experience, what do they think while looking for the cheapest price (will they get the cheapest price on this website and will the price change later) and what do they feel (lets pay it by it before it changes). By following some basic templates we can rethink our products and imagine the customer journey in a manner that we could live it on a daily basis. The love / empathy towards our customers, which results in benefits for the customer and eventually helps in designing the WOW (delight) moments are what makes a lasting impact and creates a bond between the brand and the customers. Hence, design is one of the main pillars of building a successful product and I hope we all can make design an integral part of the organization. Our thinking should bring compassion and love to customers through Design. Deepa is a design and product leader who most recently worked at Intuit as the Director of Design and Product Management. Deepa’s passion is to transform customers’ lives by creating products that solve their biggest unmet needs. Deepa has 20 years of experience in the Tech industry where she has played a variety of roles across Product Development, Experience Design, Product Management and General Manager. Deepa’s experience has given her expertise in creating and taking global products for both emerging markets as well as developed markets across multiple domains. What is design iteration4 ? Design Thinking is helping entrepreneurs in our time directly approach complex problems and innovate disruptive solutions that change lives! Awesome experiences start with developing deep insights about your customer, creating a clear and well understood customer benefit. This Playbook Roundtable is scheduled for 28th November(Saturday) in Bangalore and will be led by Deepa Bachu from Pensaar. This Design Thinking Playbook is open to innovative start−ups and passionate entrepreneurs who are ready to accept one of the first challenges in Design Thinking: Your user knows best!